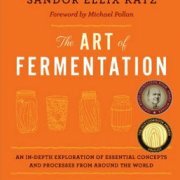 Beginner’s Fermentation: Kombucha – Home-made, fermented, probiotic, joy! In the past I was always a bit nonplussed when it came to kombucha. I didn’t think I liked the taste, and I was sceptical of the claimed health benefits. But now I’ve found out more about it, and discovered how easy and fun it is to make at home, I’m definitely a kombucha convert! Kombucha is a fermented drink made from tea. It is made using a ‘kombucha mother’, also called a ‘kombucha scoby’ (or sometimes ‘the tea beast’!) which is a gelatinous colony of bacteria and yeast. The mother is added to a container of sweet black tea, and over the period of a couple of days to a couple of weeks the bacteria and yeast feed off of the sugar, and produce a range of nutrients which fortify the tea. 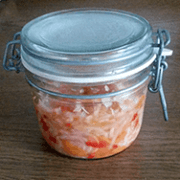 It’s also an ideal ferment for beginners. Kombucha is credited with anti-viral and anti-fungal properties. 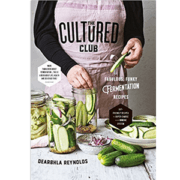 Like all ferments, it is a ‘living’ substance, containing healthful ‘friendly bacteria’, which are essential for immunity, digestion, and nutrient absorption. It also contains vitamins and amino acids. In ancient China it was called the ‘tea of immortality’ and in Chinese Medicine terms it can be said to strengthen the center (Spleen and Stomach) and clear Dampness and Phlegm. 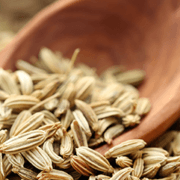 Given its Pungent and Sour flavour, I would also suggest that it acts on the Liver, and helps to clear stagnation. 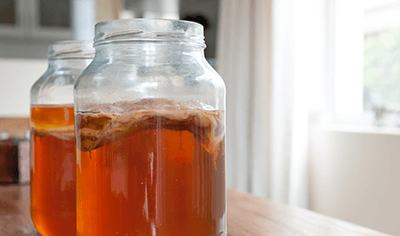 Once you’ve got hold of a kombucha scoby (or ‘mother’) it can be reused indefinitely. To make kombucha, add 4 tea bags (ideally organic) and 100-200g of sugar to 1 ltr of boiling water, stir to dissolve sugar, and allow to steep until the water is lukewarm or completely cool. Discard teabags. If possible, add 100-200ml of old kombucha from your last batch. Then add cold water until you’ve got 2ltrs of strong, sweet tea. Transfer your cooled tea into a glass container of some kind, and add the scoby. The best vessel for brewing your kombucha is said to be a bowl with a large surface area, but I find it easier in a large jar. Cover with a cloth to keep out flies or dust but don’t seal closed as this would cause a pressure build up. Now, simply leave it to ferment. Somewhere warmish is best – mine just sits on the kitchen counter. Gradually, the yeast and bacteria in the scoby will ‘eat’ the sugar in the tea solution, and the taste will become less sweet, and more pungent and sour. Very mature komucha is quite vinegary, and although some people like it that way, you may prefer to stop yours a little earlier while it still retains some sweetness. Start tasting after a week or so, and then every few days, noting how the flavour changes. You can easily leave your kombucha brewing for 2-3 weeks. Even if you forget, and leave it for a month or 2, the scoby will still be fine, although your kombucha will be extremely strong. Eventually, once all the sugar runs out, the scoby will start to starve and then die, but the advantage of kombucha is that it’s pretty hardy. IMPORTANT – your kombucha will carry on fermenting in the bottles and pressure will build up. A little fermentation will make your kombucha nicely carbonated, but too much will cause exploding bottles. Needless to say, this can be extremely dangerous! I recommend using bottles designed to withstand some pressure, like the flip top (Grolsch type) glass bottles. Keeping in the fridge (or somewhere else cold) is important as it slows fermentation to a minimum. A good practice is to fill just 1 plastic bottle with kombucha, along with the glass ones. Then you can test how much pressure is building up by periodically squeezing the plastic bottle. If it becomes highly pressurised and hard to squeeze, open it, and all of your glass bottles, to release the pressure, and then reseal. Alternatively, just make sure you drink all your kombucha within a few days, and you’ll be fine! Every time you make kombucha you will also get a new ‘mother’ forming and/or your existing scoby will grow in size. At first the existing mother that you put in sinks to the bottom. After a day or 2 you can start to see a film appearing on the surface of the kombucha. Don’t be afraid – this isn’t mould, but the beginnings of a new mother. After another couple of days it will be thicker, and will resemble the original mother. Once you have finished, you can use each of your mothers to make 2 seperate batches of kombucha, give one away, or compost it. A mother will also keep for a couple of weeks in the fridge in a cupful or so of mature kombucha. 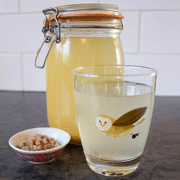 https://www.neilkingham.com/wp/wp-content/uploads/2011/09/bigstock-Kombucha-Tea-In-A-Glass-Jar-154789922.png 236 400 Neil Kingham https://www.neilkingham.com/wp/wp-content/uploads/2016/04/logo-painted.gif Neil Kingham2011-09-19 17:50:032018-04-16 15:46:05Beginner's Fermentation: Kombucha - Home-made, fermented, probiotic, joy!